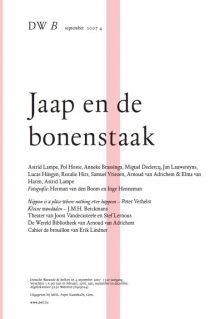 On September 28, 2007, at Perdu, Amsterdam, the new issue of the Belgian literary review DWB (vol. 152 no. 4, September 2007) is presented at Perdu, Amsterdam. The issue contains a special feature titled Jaap en de Bonenstaak (“Jack and the beanstalk”). The night is hosted by Arnoud van Adrichem and Elma van Haren. Astrid Lampe, Pol Hoste and Anneke Brassinga read texts. Miguel Declercq presents a graphic story. Musical compositions on original texts by Samuel Vriezen and Rozalie Hirs are performed by the Jackson Mac Low Band. Rozalie Hirs shows her concept of ‘betekenisritme’ (‘signifying rhythm’) using the typographic rhythms in her poem ‘Vlinders gras’, resulting in the composition Vlinders gras that is performed tonight. She wrote the poem at the request of Arnoud van Adrichem in reaction to the poem ‘Houd jij dit maar uit elkaar?’ by Lucas Hüsgen, part of the same DWB feature.